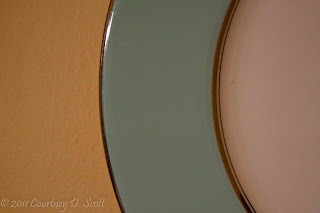 What to blog about in late January when everything is covered in snow and my motivation is just as frosty? Stuff in my warm cozy house! 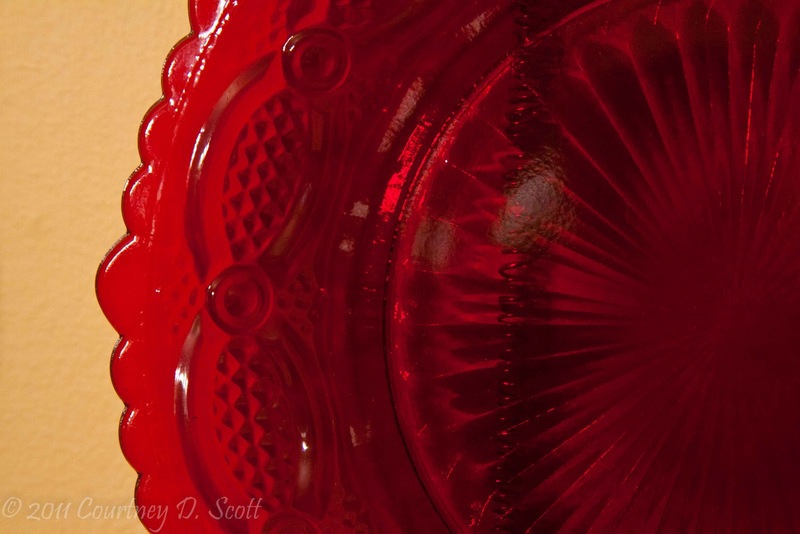 This is the second in a series of posts about some of my family heirlooms. 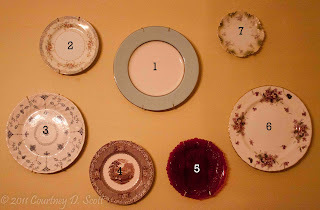 In the first post in the series, I mentioned the different sets of china that we might have eaten a holiday meal or two from when I was a child. You probably wondered what that was all about. Soon you will know. I did not register for fine china before I got married. 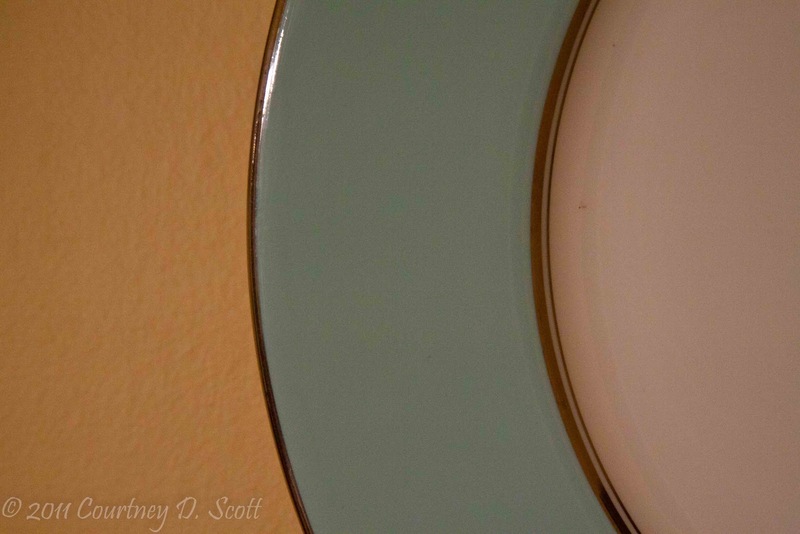 Fine china was not something that was important to me at that time. I registered for more practical things and did not see my life evolving into one where fine china would play a vital role. Plus, I had a backup plan if my life did evolve into such. Being the only daughter of two only children who were the holders of several sets of china from the previous generations, I felt sure if the need arose I would have a set of fine china at some point in my life. It might not be one that I selected, but that would not bother me. 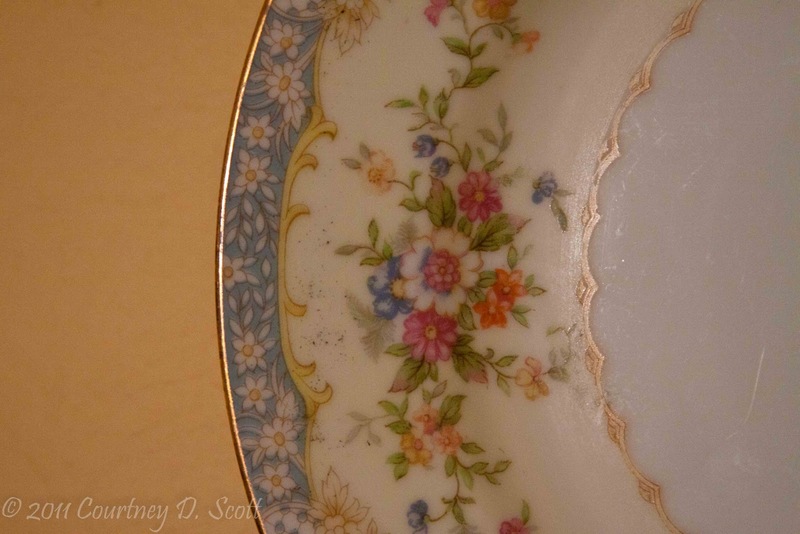 Sixteen years later, fine china still does not play a vital role in my life but I do have a set of china that belonged to my maternal grandmother, Oma. 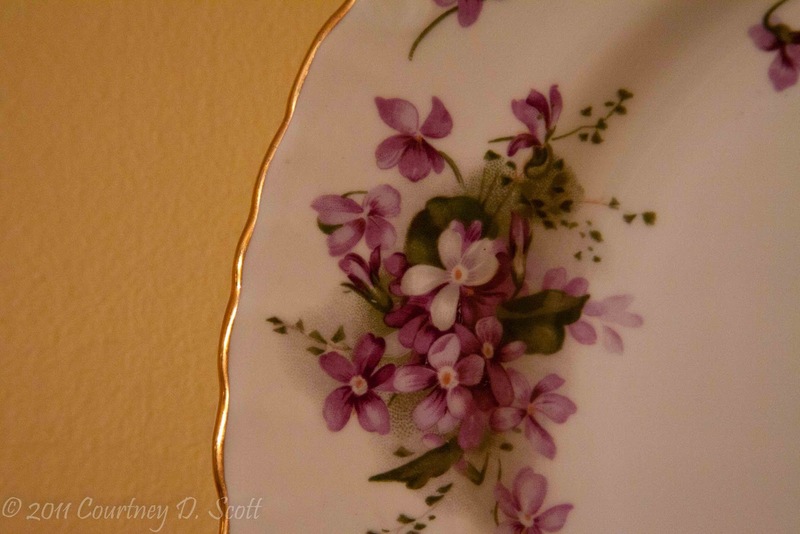 It is her Noritake from the early 1930s. Some pieces were broken through various moves and stints in storage. But I have nearly all that I would need to present a nicely coordinated, formal meal. But that doesn't happen very often. 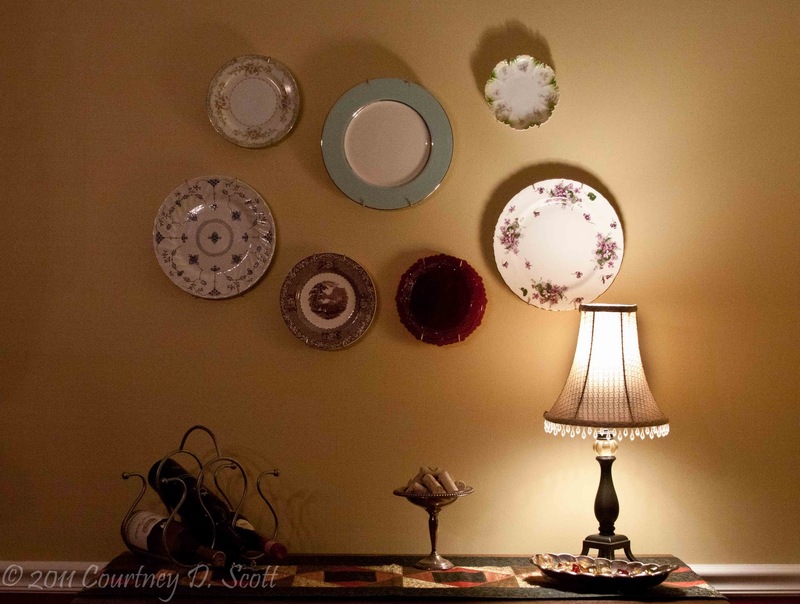 I also have pieces of china from other family members and have them displayed in my dining room. I have them hanging in an odd-numbered arrangement, just like Martha would expect. The centerpiece is my parent's wedding china, Castleton Turquiose, from 1956. It is simple and elegant with its silver border. ﻿One of Oma's Noritake Naomi salad plates hangs to the upper left of the Castleton. To the lower left hangs a dinner plate, my parent's Myott Finlandia Staffordshire, that mom acquired in the not too distant past. 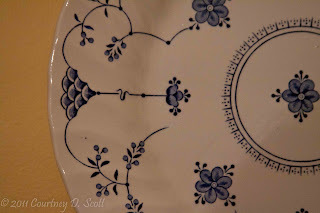 While we're on the topic of Staffordshire, I have Granmaggie's (my paternal grandmother) Jenny Lind Staffordshire salad plate hanging on the bottom left. 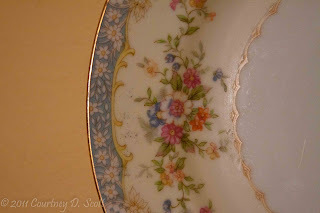 She was married in 1932 and probably got her china sometime in the late 1940s. ﻿And continuing in a counter clockwise manner, on the bottom right is a 1970s Avon Cape Cod salad plate belonging to Oma. On the far right side is also one of Oma's, her Hammersley Victorian Violets﻿. Of all the patterns it looks like it belongs at a tea party the most. 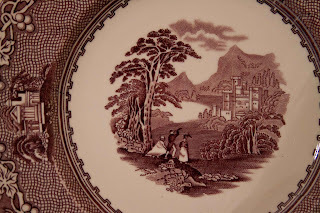 With three contributions to my collection of seven, it appears Oma had a thing for china. 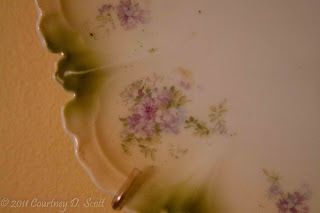 And lastly, the oldest piece I have is a handpainted dessert plate from the early 20th century. It belonged to Irm (my paternal great-grandmother) who was married in 1908. While I am still a practical girl (somewhat) who has little servicable use for a full set of fine china, I love my heritage hanging on my dining room wall﻿ and Oma's Noritake sitting at ready in the buffet for all those formal meals I might one day host. It would be hard to choose a favorite from that pretty collection.